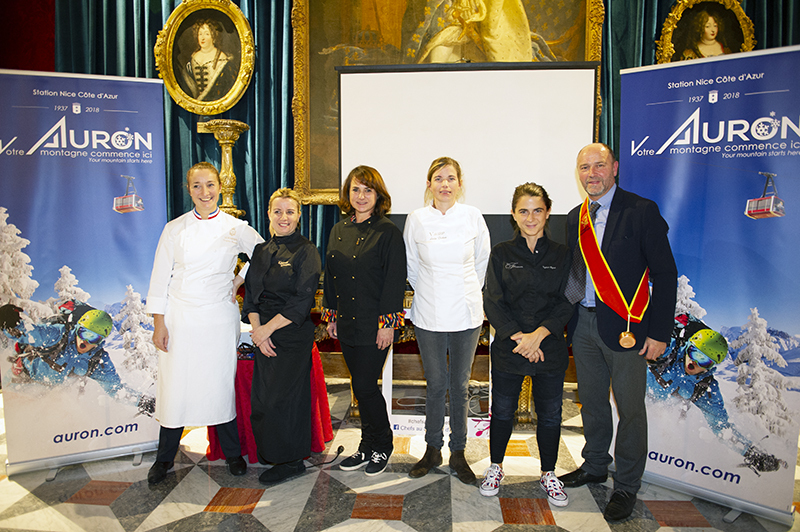 The Chefs au Sommet d’Auron 2019 unveiled at the Hotel Negresco in Nice its delicious gastronomic program, sunny and locavore, to take gourmets to the heights of taste. Chefs au Sommet d’Auron is a culinary event celebrating gastronomic delights in Auron, Saint-Damas-le-Selvage and Saint-Étienne de Tinée. For a week, the Festival of Mountain Gastronomy will honor under the patronage of Virginie Basselot, chef of Le Chantecler, the Haute Gastronomy on the slopes of Auron and the resorts of Haute Tinée. From 19th to 25th January 2019, skiing, sun and gastronomy take you on the snowy slopes of alpine delights! An event of sharing and culinary happiness to urgently add to your winter holidays! 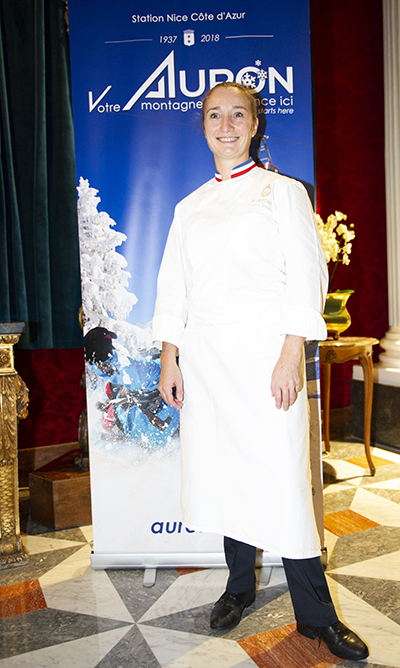 For the 8th edition of the Chefs au Sommet d’Auron and for the first time, a young woman, Virginie Basselot, executive chef of the Michelin-starred restaurant Le Chantecler, La Rotonde Brasserie and the banquets of the Hôtel Negresco in Nice, will sponsor the culinary event. 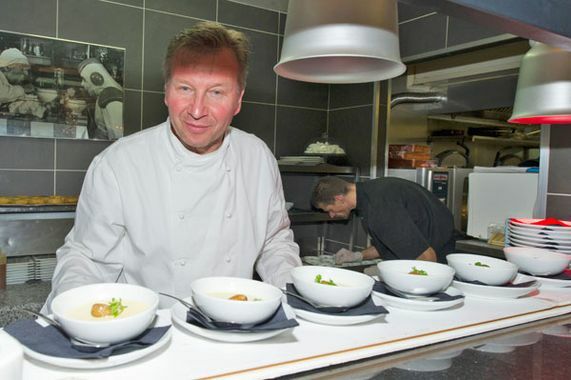 The chef is emboduing one of the leading figures of the younger generation in the French gastronomic landscape. 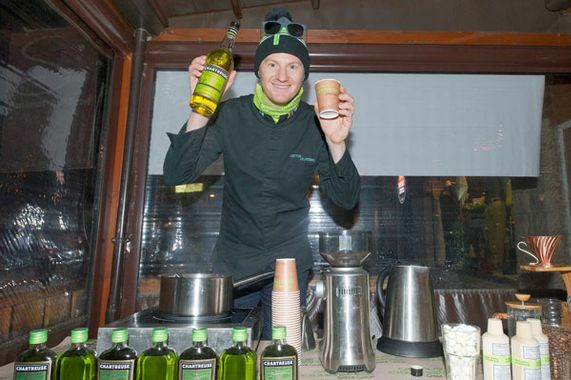 Building on the success of the previous editions, the Festival of Mountain Gastronomy, organized by the Auron Tourist Office, supported by Auron, Saint-Étienne de Tinée, the SEM des Cimes du Mercantour, the Chamber of Trades Alpes-Maritimes and Artisans Arts and Delights, will honor Locavore and Bio products. 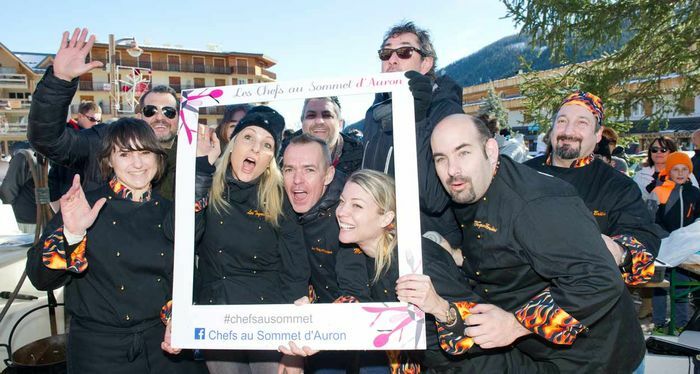 The Chefs au Sommet d’Auron, the high-altitude culinary event in the sumptuous snow-capped peaks of Mercantour in the Southern Alps, will be celebrating mountain gastronomy with the greatest chefs from the coast from Saturday to Thursday. 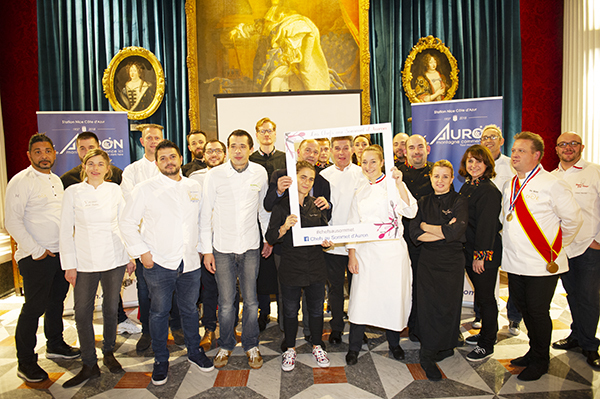 The restaurants in Auron, Saint-Damas-le-Selvage and Saint-Étienne de Tinée will welcome renowned Chefs and Pastry Chefs from the region into their kitchens. Every evening, three different chefs will officiate in three restaurants and will perform an exceptional dinner. In a warm and authentic atmosphere, holidaymakers and inhabitants of the valley will have the opportunity to taste real gastronomic menus at a special and unique price of 45 euros. Composed of an amuse-bouche, an entrée, a main course and a dessert, the menus will surely delight the gourmets’ taste buds. The Chefs will let the gourmets discover the French culinary art with the best products of the Mercantour, sublimated and honored during this delicious event on the theme of Locavore and Bio, some products from short circuits, expressing the love of the terroir. 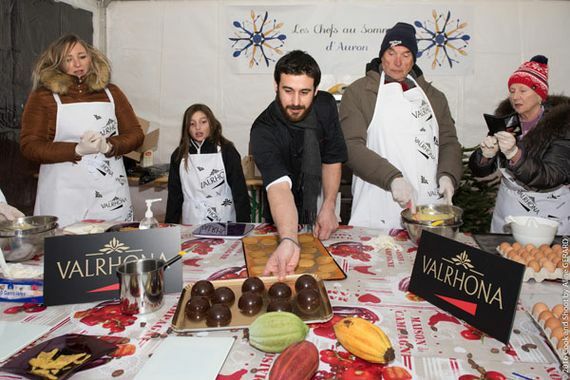 This festive program will also give a spotlight on the mountain products largely provided by the Association Montagnes Paysannes, a group of producers from Puget-théniers. Cuisine of Haute Tinée and old recipes revisited will be the spearhead of this beautiful gourmand event. 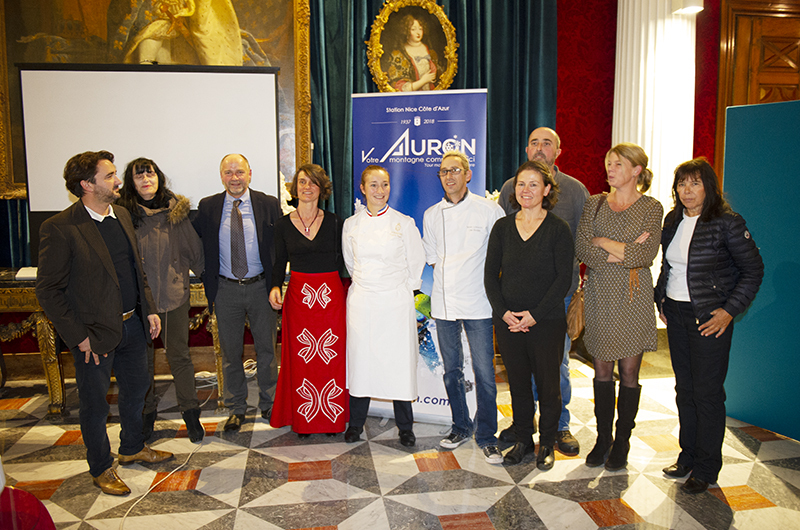 Michel Guillot, President of the Tourist Office of the Mercantour Stations, unveiled the enticing program of the Chefs au Sommet d’Auron on November 30, 2018 in the salons of the Hotel Negresco in Nice, in the presence of the chefs, partners and actors who will animate the Festival of Mountain Gastronomy. Victor Delpierre, Cocktail & Barista World Champion, will enliven the restaurants with After-Ski Demos and Cocktails Parties and will share with all the skiers, his official cocktail specially created for the Auron station: Le Riounet. 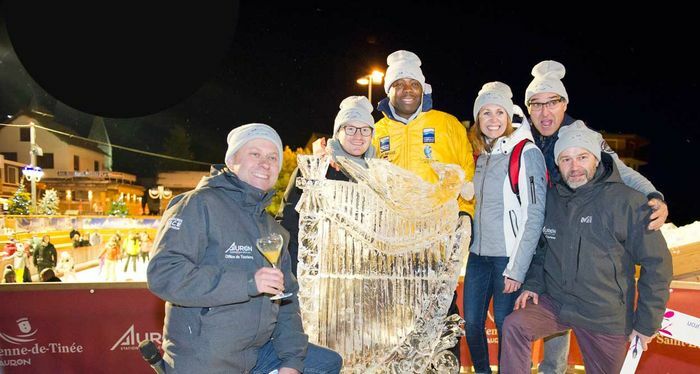 Throughout the weekend, ice sculpture artists will show their talent in the heart of the Auron resort. The inevitable Chaudron Soup over a wood fire and gourmet ballads on the slopes, were very successful last year, will be repeated for the pleasure of amateurs who want to taste the thrills and the pleasure of hiking with their mouths full and a happy heart. 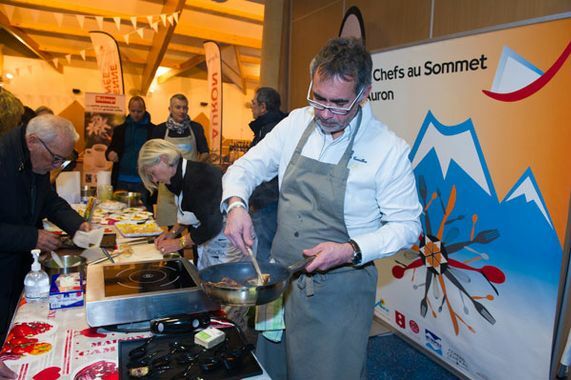 The Chefs au Sommet d’Auron will begin with a weekend of gastronomic events. 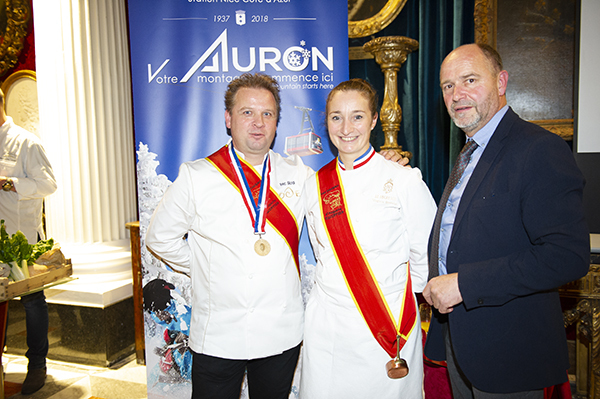 To whet appetites of litlle gourmands and big gourmets, the festivities will begin on Saturday, January 19, 2019 with the inauguration of the Chefs au Sommet d’Auron in the presence of the godmother Virginie Basselot. 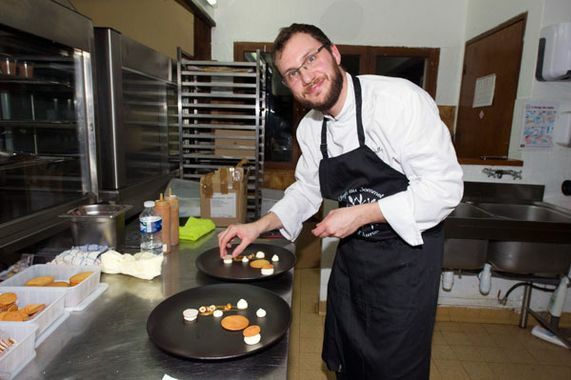 On Sunday, gastronomes will have the choice between a Show Cooking with tasting of grilled food at the foot of the slopes, made by the Toques Brûlées, driven by the effervescent David Faure. The high gear chefs will ignite the snow front with their giant barbecue. 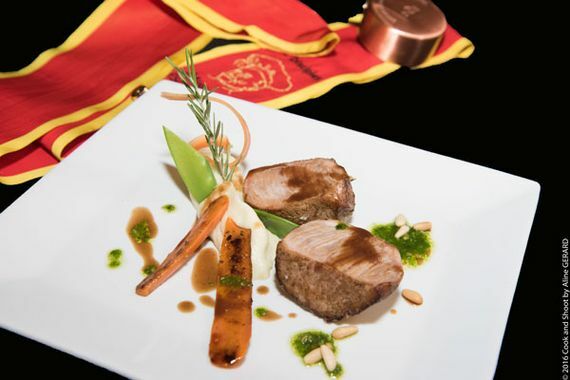 The most athletic may participate in gastronomic games on the ski area. While the parents will be in the kitchen of the workshops, their little devils will be able, according to their mood, to play the apprentices cooks like mom and dad by realizing one of their favorite dish or to attend cooking demonstrations and playful workshops. Every evening, a gourmand five-to-seven around the ice rink will propose a market of local products, workshops and demonstrations of pastry organized by the Union of Artisan Pastry Chocolatiers of Alpes-Maritimes, but also introductions to oenology, dietetics, Locavore, organic products… many fun and very slippery animations will entertain without moderation children of any age. Eugénie Beziat (La Flibuste – Villeneuve-Loubet), Alain Llorca et Jean-Michel Llorca (Alain Llorca – La Colle sur Loup), Benoît Witz et Luc Gamel (Hôtel L’Hermitage – Monaco), Karine Skuteri (Le K – Saint Paul de Vence), Lucie Pichon (La Cigale Vista Beach – Roquebrune Cap Martin), Linda Pace et Gabriel Degenne (Château de la Begude – Valbonne), Willy et Camille Carton (Vegan Gorilla – Nice), Hermance et Quentin Joplet (Le Castellaras – Fayence), Geoffrey Poesson (La Badiane – Sainte Maxime), Rédouane Mansouri (Blue Pearl – Cagnes sur Mer), Akhara Chay (La Vague de Saint Paul – Saint Paul de Vence), Christophe Billau (La Quintessence – Roubion), Aurélien Nourry (Le Millésime – Nice). Bruno Laffargue (Mic-Mac Macaron – Cagnes sur Mer), Philippe Brito (Philippe Brito – Cannes), Pascal Picasse (Le Park 45 – Cannes), Steve Moracchini (Hôtel Belles Rives – Juan Les Pins – élu Chef Pâtissier de l’Année Gault&Millau en 2016), Fabrice Didier (Hôtel Negresco), Julien Matteo (Novotel – Sophia Antipolis), Yohan Gouverneur (Premier Catering – Villeneuve-Loubet), Christophe Canet (Patisserie Canet – Nice), Maxime Simenot (Bessem Restaurant – Mandelieu), Jean-Luc Keneally (Hôtel Le Mas de Pierre – Saint Paul de Vence). Balicco, Deloye Marée, Naturdis, Valrhona, Ecotel, PainPetitfour, Marius Auda, SNDA, Mic Mac Macaron, Capfruit, Panier des Chefs, Montagnes Paysannes, Frima. Clément Design, Philipponnat, Le Clos, Romauresq, Les Toques Brûlées, Malongo, Fiers d’être Artisans, Foricher Les Moulins, Ice Candle, Les Disciples d’Escoffier, MOF Côte d’Azur, CCI Nice Côte d’Azur, Le Negresco, Cook and Shoot, Victor Delpierre. Partenaires Médias: Azur TV, YesICannes.com, Le Blog de Gilles Pudlowski et les Nouvelles Gastronomiques.